So…a transition from fog to maybe a little bit of snow? Mother Nature likes to keep things interesting, that’s for sure! The forecast for tonight through Friday night will be very familiar to those who have been living here the past week. Now say it with me: “Mostly cloudy skies with some morning fog. Highs will be in the 30s to lower 40s.” I think that when this pattern actually snaps out of it, us Kitsapers aren’t going to know what to do with ourselves. Save for a few days of sunshine this month (not even consecutively!) it’s been a pretty dark and cold month. And for those who love that kind of stuff (ok, I’ll admit it…I love cold and dark weather) better get ready for some more! DAY 1 OF ARCTIC SEEPAGE (Saturday): This is not going to be an impressive day for cold: highs in the mid to upper 30s around the area…pretty much what we’ve been experiencing the past few days under the inversion. It’s Saturday night that looks a bit more interesting as some of that northerly air spills into the Kitsap area, dropping low temperatures in the the upper 20s to lower 30s. The big question is: how much moisture will we have to work with when the cold air arrives? Right now, it’s looking like a pretty small event: maybe a few flurries or light snow showers. Nothing of big concern at this moment. If you happen to be traveling south of Olympia Saturday night or Sunday, however, be prepared for an icy commute with a couple inches possible. 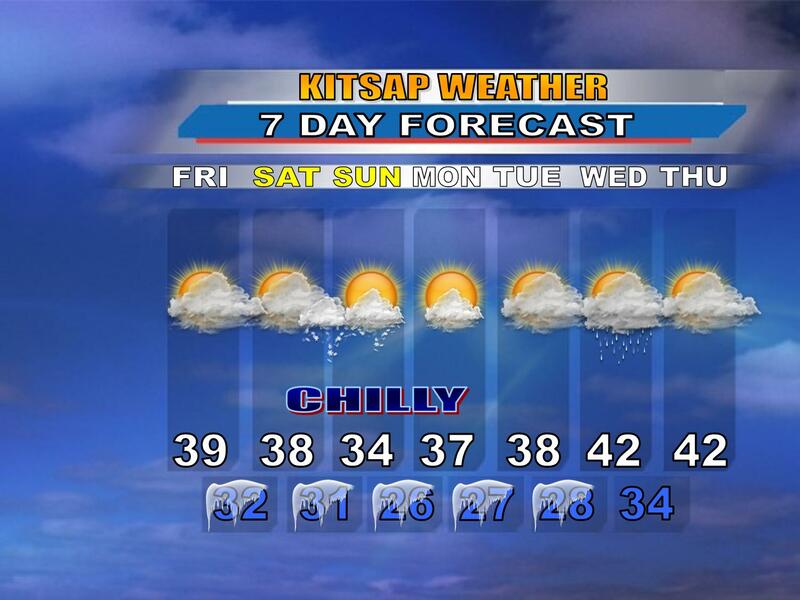 DAY 2 OF ARCTIC SEEPAGE (Sunday): Sunday will be the coldest day: highs will be in the low to mid 30s. Some models are completely dry, have very light snow amounts or have moderate snow amounts. At this time, expect a chance for light snow in the morning hours shutting off by mid day as skies clear. This system will certainly need to be watched closely as new developments could make this situation more interesting. Best thing to do right now? Be prepared for anything! DAY 3 OF ARCTIC SEEPAGE (Monday): Monday morning will be the coldest morning of the next 7 days. By the time most people wake up in the morning, low temperatures will be in the mid 20s, so plan accordingly! We should see enough sun Monday afternoon to make most people happy and *warmer*, but high temperatures will likely stay in the 30s again, though a few degrees warmer than Sunday. And then Tuesday and beyond starts like a warming trend…for now. It was looking like showers and seasonable temperatures would dominate the forecast for the rest of next week, but the most recent run of models suggests we may stay quite chilly (highs in the 30s) through the rest of next week and beyond with low snow levels. Right now, I’ll keep highs cooler than normal with a chance for a few light *rain* showers mid week.